LONDON - Japanese shares outperformed all others Tuesday following last week's surprise stimulus from the country's central bank. Oil prices were also in focus, falling to four-year lows following reports that Saudi Arabia has cut its prices to the U.S. In Europe, Germany's DAX was up 0.2 percent to 9,267 while France's CAC-40 fell the same rate to 4,186. The FTSE 100 of leading British shares was flat at 6,486. Wall Street was poised for modest declines at the open, with Dow and S&P 500 futures both down 0.2 percent. Oil prices sank sharply following reports Saudi Arabia, OPEC's largest oil producer, is cutting prices for customers in the U.S. A barrel of benchmark crude was down $2.07, or 2.6 percent, at $76.79, its lowest level since September 2010. Brent crude, the international benchmark, was down $2.14, or 2.5 percent, at $82.63 a barrel, its lowest level since October 2010. Many in the markets are blaming Tuesday's weakness in stocks on the fall in oil prices. However, Craig Erlam, an analyst at Alpari, said he didn't buy into that because weaker oil prices are "actually a hidden stimulus" for the global economy -- and that is a potential boon for stocks. One place where investors are applauding stimulus is in Japan. Last Friday's announcement by the Bank of Japan to boost asset purchases and the public pension fund's decision to pare its bond holdings and raise its investments in shares have combined to send Japanese stocks soaring and the yen sliding. 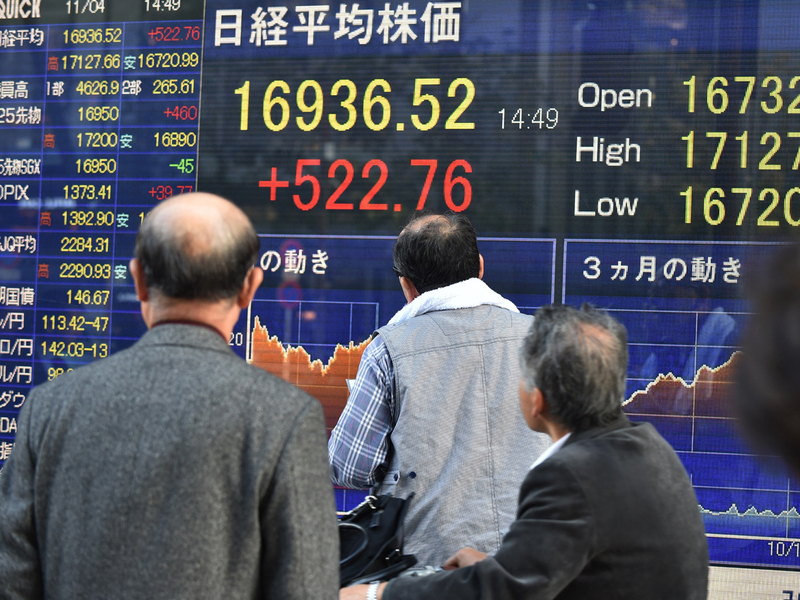 In its first trading day since Japan announced the new measures - the market was closed Monday for a holiday - Tokyo's Nikkei ended 2.7 percent higher at a seven-year closing high of 16,862.47. The yen, which fell Monday to near seven-year lows against the dollar, was flat, with the dollar 0.1 percent lower at 113.48 yen. Elsewhere in Asia, the mood was less upbeat following some disappointing Chinese manufacturing data. The main Shanghai index closed flat at 2,545 while Hong Kong's Hang Seng slipped 0.3 percent to 23,845.66. South Korea's Kospi ended 0.9 percent lower at 1,935.19. In Europe and the U.S., traders have a raft of economic news to digest over the coming week. How markets close out the week could hinge on the monthly policy meeting of the European Central Bank and the October U.S. nonfarm payrolls data. The jobs data could be particularly important as investors assess when the U.S. Federal Reserve will start raising interest rates now that it has brought its stimulus program to an end. Earnings will also to continue to get attention.